Kingspan Kooltherm pipe insulation lagging is available in a selection of wall thicknesses, pipe sizes and pipe lengths so there's no need for excess waste on fitting them. 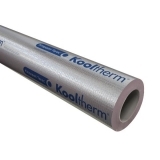 Kooltherm pipe lagging is designed to insulate pipes against extreme temperatures, preventing water pipes for example from freezing up in the winter. This particular Kingspan Kooltherm lagging though also offers fire perfomance as the lagging is hard to ignite since it has such a dense structure.